People of Dev Bhoomi Himachal has always been a part of adventurous sports knowingly or unknowingly. Mountaineering, Crossing rivers either in Jhoola(Wooden box fixed with a pulley in rope ), by swimming or by boats has always been part of daily life for Himachali's. With the economic, social and technological development, all these daily activities has now become sports activities for tourists and even for the people of Himachal. Latest technology, grass root development in all walks of life has introduced few new sports in Himachal like mountain biking, Car rally(Raid-De-Himalaya), Rafting and aero sports like Gliding. Hang Gliding started in Himachal in Eighties from Bir-Billing. Billing in Himachal Pradesh is located at 2290 mts. from sea level in the Kangra valley. Billing has the credit for organizing the very first Paragliding competition according to the rules of Federation Aeronautique International. Billing is considered to be one of the best takeoff points for hang Gliding and Paragliding. The unadorned peak of Billing, above the Buddhist monastery of Bir in Kangra(Himachal Pradesh), has been the venue for five national and three international hang-gliding rallies since 1984. Shielded by the mountains and surrounded by lush green tea gardens, Bir a small village with a Tibetan Colony(Chaugan) and monasteries in Kangra district, serves as a landing ground and a base for Hang and Para gliders. For last few years only paragliding competitions are being organized in Bir-Billing and Hang gliding has become a thing of past. Himachal Pradesh Tourism Corporation (HTDC) organizes aero sports training courses and events at various times of the year. 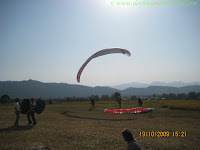 HTDC also runs Aero Sports Complex at Bir which imparts training in Paragliding and Hang-Gliding. The Department of Tourism and Civil Aviation, Government of Himachal Pradesh organizes the 'Para Gliding Pre world Cup' at Billing- Bir every year in the month of October . If you love adventure, greenery and wanted to feel fresh and energetic then do visit Bir-billing in the month of October. Bir is approximately 30 Kms from Palampur whereas Billing is only 14 kms from Bir.